Classic Slots Scratch Card Guide & Review - Casino Answers! 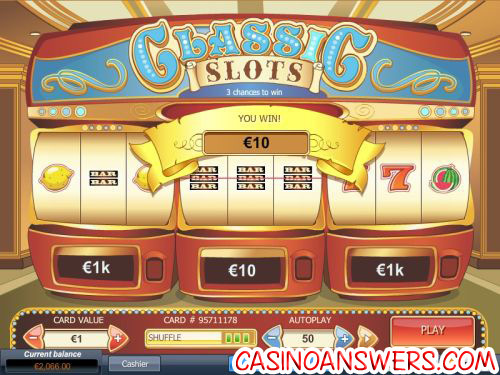 Classic Slots is an instant win online scratch card developed by Playtech. You can play the Classic Slots scratch card game at Jackpot Scratch Casino and Windows Casino. To start playing the Classic Slots scratch card from Playtech, you must first select a card value. Card values available are $0.50, $1, $2, $5 and $10 (also available in other currencies). Once you have chosen your card price, hit the “Play” button to start playing Classic Slots! Once you have your Classic Slots scratch card, you can now take your coin and click on one of the three slot machines. It will uncover three symbols and then it will automatically scratch the winning amount. If you are able to match three of one symbol, you will win the prize listed below the slot machine. If you get a winning combination, a line will be displayed on the slot machine and the game will play a sound effect. If your win is large enough, a banner will be played that shows your winnings as well. You have three chances to win. Alternatively, you can use the “Scratch All” button to save yourself some time. Prizes on the Classic Slots scratch card include: 1X, 2X, 4X, 10X, 20X, 50X, 100X 200X and 1000X your card value. Depending on your card value, you can win up to $10,000 playing the Classic Slots scratch ticket. There is an autoplay mode available on the Classic Slots scratch and win game. You can play up to 99 autoplay scratch cards. You can either type in your desired number of games or use the “+” and “-” buttons. Hit the play symbol (not the “Play” button) next to the autoplay box to start the autoplay mode. You can cancel the Classic Slots autoplay mode at any time by hitting the stop symbol. If you are a fan of both scratch cards and slot machines, you will definitely enjoy the Classic Slots scratch card game. It’s easy to play, games move fast and you can win up to $10,000! To play Classic Slots for free, visit Jackpot Scratch Casino! Are players from the United States able to play Classic Slots for real money? Players based in the United States of America are unfortunately unable to play the Classic Slots scratch off game. For a great selection of scratch cards (as well as classic slots) that USA players can play, please visit Lucky Red Casino. Where can I play a Flash game of the Classic Slots scratchie for free? You can play a Flash version of Classic Slots for free and real money at Jackpot Scratch Casino. Jackpot Scratch is Instant Play only and does not offer a downloadable casino client. If you experience any problems with the Flash game, make sure you have the latest version of Adobe Flash Player installed. What downloadable casinos can I find Classic Slots at? If you are looking for an online casino with a downloadable client to play the Classic Slots scratch and win game on, we recommend Windows Casino. Are there any slot scratch card games?